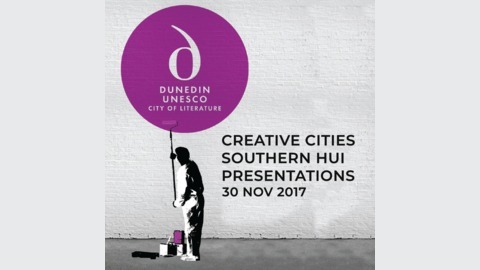 ‘Creative Connections’ - presentations from Dunedin UNESCO City of Literature’s ‘Creative Cities Southern Hui’, sponsored by the New Zealand National Commission for UNESCO and in partnership with University of Otago's Centre for the Book. 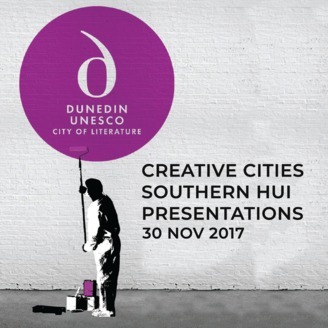 Held in Ōtepoti Dunedin between November 28th and December 2nd 2017, the free hui hosted many fruitful conversations across the arts as local and global creative minds met to share and collaborate. The City of Literature’s ‘Creative Connections’ programme explored creativity as the touchstone of healthy, sustainable communities, and celebrated the power of collaboration to inspire. Local and international guest speakers from a range of backgrounds and creative fields gathered at the Dunedin Public Art Gallery Auditorium for an invigorating, inspiring day of presentations. In this series, we share those presentations with you, introduced by Master of Ceremonies Victor Billot from Otago University Press. Victor Billot closes the session with a thank you to contributors and supporters, also Linda Cullen from the Dunedin Public Art Gallery presents what is happening at the gallery.